After a long (and fun) night hitting the night life scene in Hanoi, I was ready to explore another side of the city — its cuisine. One of my favorite things about traveling is being able to see new places, immerse myself in foreign cultures and taste exciting flavors. The Vietnamese food scene is perhaps best well known for pho, the national dish, which is sold pretty much everywhere you go. But I wanted to get a taste of something different. 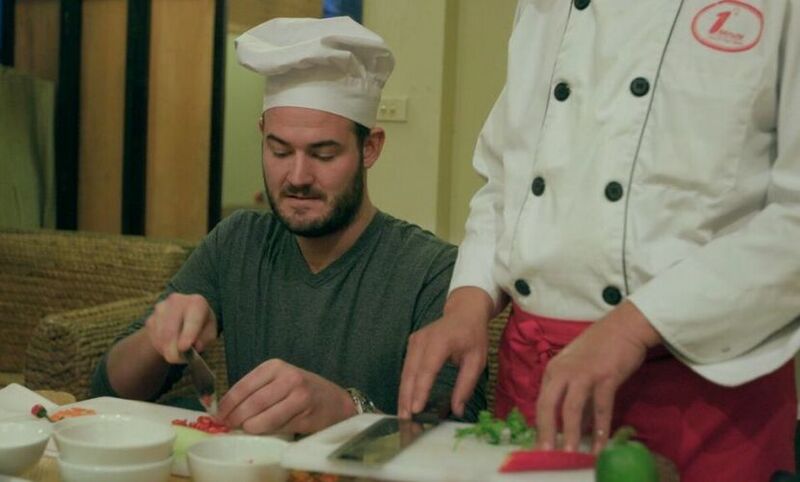 So, I found one of the best chefs in Hanoi and learned how to prepare bún chả — a specialty in Hanoi. If you’ve never been to Hanoi, food is everywhere — it’s on street corners, people carry it with them and it’s always being transported by bike or moped. The variety of food and the way people eat it is really neat — I knew I had to try some new things. That’s when I found bún chả, a Hanoi specialty that includes a juicy pork patty barbecued over an open grill and served with cold rice noodles, fresh greens and a sweet chili sauce. I first tasted it — as one usually does when in Hanoi — on the street. I was hooked instantly and wanted to try more. Preparing bún chả was no easy task. So I headed for Cuisine Viet, located in the center of Hanoi, to learn from one of the best chefs in the city, chef Nhan. Unfortunately, booking a cooking class at Cuisine Viet requires cash — so no credit cards here. And as someone who doesn’t normally carry cash because I’m always looking to swipe my credit cards and rack up points, I had to visit an ATM to take out the money. In order to avoid pesky ATM withdrawal fees while abroad, I used my Chase Private Client membership to my advantage — the bank waives all cash withdrawal fees. It took concentration to not chop my fingers off. After a couple of short introductions and putting on my official chef toque, chef Nhan put me straight to work. We started with a nice, large slab of pork. From there, we had to chop the pork and vegetables up into fine pieces — so the real challenge was not chopping off my fingers in the process. From there, I started forming the patties — mine ended up looking something similar to an American hamburger. Then we took them to the grill, which was actually the most difficult part of the process. Not only did we have to monitor the meat to make sure it was perfectly cooked, but we also had to waft the fire to keep the coals hot. Putting the sauces to the test — whose was best? My bún chả turned out pretty good — except for the sauce. Chef Nhan didn’t really approve of my sauce, and I’ll admit it wasn’t the best, but I think I did a good job as a beginner. Chef Nhan then decided to see whose dish was best. 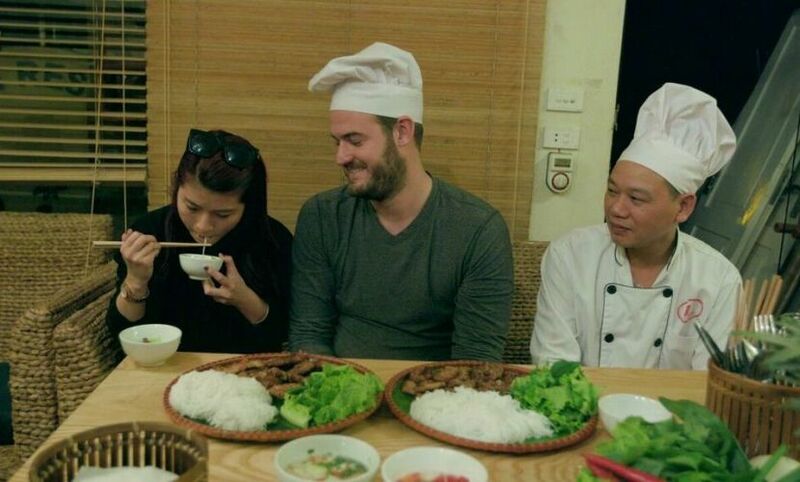 We asked my Vietnam guide, Vi, who’s been eating this food her whole life, to be the food critic. The challenge: Whose sauce was whose and — more importantly — which one was better? Well, Vi got it right; chef Nhan’s was the better of the two — I can’t be too upset about that. 1. Place sugar, fish sauce, water and vinegar in a small saucepan over high heat — let simmer for 2 minutes or until sugar dissolves. 2. Finely chop chili and add to saucepan with the garlic and lime juice. Stir and combine, then transfer mixture into 4 small individual sauce bowls. 3. For the patties, combine pork, garlic, egg, shallot, chopped mint, fish sauce and pepper in a bowl. Roll into 16 small balls. Gently pat to flatten into patties. 4. Heat the oil in a large frying pan over medium-high heat. Cook the patties in 2 batches for 3 minutes on each side or until golden and cooked through. 5. Meanwhile, place noodles in a heatproof bowl. Cover with boiling water and stand for 2 minutes or until tender. Drain well. 6. Arrange the noodles and patties on a platter with garnishes like mint leaves, coriander and bean sprouts. 7. Divide the dressing among 4 individual serving bowls. Can’t wait to see what I’m working on next? Follow all my travel adventures on Facebook, Twitter, Instagram and Snapchat for a behind-the-scenes look at what’s coming up on TPGtv, and don’t forget to subscribe to The Points Guy on YouTube — you’ll be notified as soon as each new episode appears.